Anna Yiangou is currently working at the "Hope For Children" CRC Policy Center as Administration Officer based at the headquarters of the organization. She is mainly responsible for office administration, responding to beneficiaries, stakeholders and schools that communicate with the organization’s offices, and assisting with the organization of events and conferences. Anna Yiangou holds a Bachelor of Science in Computer Science from the University of Nicosia. 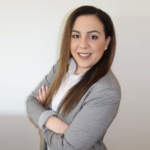 She worked as a trainee at “Societe Generale Bank Cyprus”, and as a part-time employee at “FBME Bank of Cyprus” in the Customer Service Department. She also worked for a long period at the headquarters of the “Ministry of Labour, Welfare and Social Insurance” in Nicosia as a contract officer in various departments, including the “Redundancy Department”, the "Criminal Procedures Departments" and the "Licensing Department”.